Sainsbury's supermarket is planning to move to Louth, with a new store situated in Charles Street, next to the the Co-op. The proposals will be available to browse on November 7th and 8th at the Salvation Army Hall on Church Street. 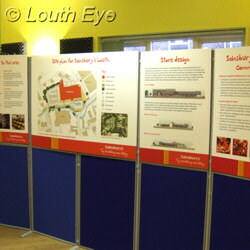 (The display that was supposed to be at the Louth Library until the end of November will not go ahead. Instead the plans will remain at the Salvation Army Hall). People will be able to give their comments and submit feedback on the plans, before a planning application is submitted to the council. As part of the application, the company will need to submit a flood risk assessment. The site is very close to the areas badly affected by flooding in 2007. According to their representative, the plans will include measures to mitigate flood risk, such as putting in new drainage systems. The level of the car park will also be lowered, in order to hold any excess water there rather than allowing it to drain into the store. As well as the issue of flooding, some people have raised concerns about the impact of a new supermarket on other shops in Louth. 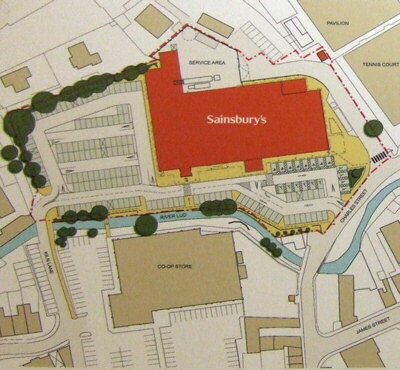 Representatives stressed Sainsbury's commitment to working with local retailers, by choosing a location close to the centre of town. Another argument in favour of this development is that a local store could dissuade customers from travelling to Grimsby for their main weekly shop. "Supermarkets employ fewer staff per thousand pounds of turnover than the local stores they replace. Most spending they gain is not new, but transferred from existing stores within the catchment area." However, Keep Louth Special is also focused on campaigning against a new supermarket at the Cattle Market.